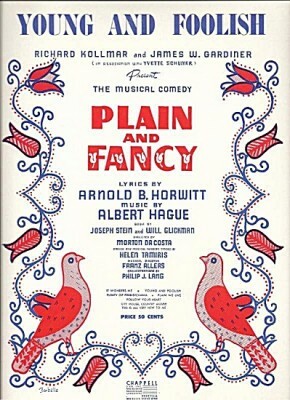 About Young and Foolish “Young and Foolish” is from the 1954 musical Plain and Fancy concerning a New York couple who travel to Amish country in Lancaster, Pennsylvania to sell a piece of property and become involved with and learn from the community. “Young and Foolish” was recorded on April 22, 1963 and released in 1963 on the album This Is All I Ask. It was arranged by Ralph Burns. “Young and Foolish” was recorded in June, 1975 and was released that year on The Tony Bennett / Bill Evans Album. “Young and Foolish” (alternate take #4) was recorded in June, 1975 and was released that year on The Tony Bennett / Bill Evans Album.